Other smart people are correctly predicting that we’re nearing the end of the era where advertising is a driving brand force of large organizations. And that has advertisers concerned — a concern that leads to desperation. In a move designed to repackage the tired old “paid celebrity endorsement” for today’s cynical audiences, the latest spin is to hand out creative titles to celebrities, in order to show how they’re influencing a brand’s offerings. Alicia Keys is BlackBerry’s Global Creative Director (who also uses an iPhone). Lady Gaga is “fairly involved” as a Creative Director at Polaroid, actually attending meetings, brainstorming, and providing feedback on products! Newly-minted Bud Light Platinum Creative Director Justin Timberlake apparently produces and stars in his own commercial work for the beer giant. Now that’s called “creative direction?” Color me skeptical. While I have plenty of respect for what each of these musicians does behind the mic, this leads one to wonder how much talent crossover there is between pop stardom and branding and marketing. Should designers, creative directors, and product engineers be worried about our jobs? I doubt it. The people who should be concerned are the stewards of these brands. 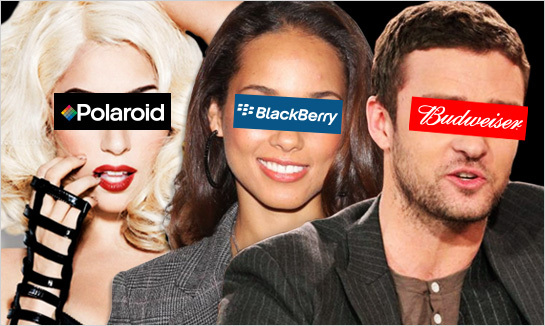 What are these celebrities doing to their most valuable asset, the brand image? The potential negative impact is more far-reaching and brand-critical than it might seem on the surface. Your brand is a constellation of products, thoughts, emotions, and ideas — some generated by the actions, offerings, and communication of your brand, and others created in the minds of your audience. The classic thinking behind celebrity endorsement is this: Brand X wants to raise its stature or reach a new demographic, and so, hitches its wagon to a star. Ideally, Celebrity X has a cultural orbit somewhat closely matching Brand X, and now that the two are aligned, new light from that star shines afresh on the product or brand. Bringing celebrities in to get their feedback and input also sends counterproductive messages to your brand’s workaday teams — that their contributions are not as valuable, and can be overlooked or overruled in the name of fashion and fame. This isn’t good for your internal and contracted teams, or the long-term health of your creative folks, who are a major engine that fires your brand. In 2013, celebrities are their own brands, and they stand for their own set of personal values — beliefs, ways of creating, political or cultural leanings, etc. Each tweet or press release is calculated to provide maximum exposure and appropriate alliances, for that person. For a celebrity who trades on their name and likeness, this is the endgame. It makes sense. And while there might be some temporary overlap with your brand, if these famous faces are savvy, their eyes are still fixed on the long term, and their own overall branding. This requires them to remain loyal only to themselves, and guarantees that they will continue transmitting their own brand messages. Whatever paid endorsement you’ve agreed upon (your brand message) is just subtext to the celebrity’s larger, personal brand messaging. Your own communications get muted and muddled, because they will never be the primary message. A transmission containing many voices is invariably less powerful and evocative, and your brand’s ethos is more valuable than that. Finally, at the heart of the celebrity endorsement premise is a fundamental flaw, because brands cannot effectively draft off the power of another body. Like a swimmer, a drafting brand requires power from somewhere else, and the “coolness” of a celebrity will only help sustain brand movement for a limited time. Celebrity attachment can’t create movement, just pass it along. It’s this unique, powerful, and singular inertia that brands need to define their personalities and carve a unique place in the universe and in the minds of audiences. Like forces of nature, great brands are powered by the will and imagination of those inside the company, to provide vision, clarity, creativity and something worthwhile to the world. This isn’t a responsibility that you can cede to a momentarily-cool celebrity. In general, I believe that bringing out the benjamins for a celebrity is an inherently insecure brand position. It makes it seem like the brand itself isn’t special or unique enough to chart its own course, and develop its singular position. The (considerable) money needed for a celebrity endorsement or “creative partnership” is better spent developing new products, messaging, and concepts that build upon the ethos of the brand, rather than seeking a transfusion of energy or coolness from some famous person. Excellent post and couldn’t agree more. It’s YOUR brand, YOUR message and YOUR money (or your investors’ money) to INVEST wisely for opportunities to grow the brand, not the line the pockets of a celebrity or a well-paid agent or management company.